MANILA, Philippines - After the 'big shake' on the TV ratings game due to AlDub's 'Tamang Panahon' grand event, audience share for GMA's Eat Bulaga and ABS-CBN's It's Showtime normalized on Saturday, October 31 for their respective Halloween episodes. TV ratings provider Kantar Media said that Eat Bulaga garnered 25.5 percent national viewers share while It's Showtime got 13.8 percent. 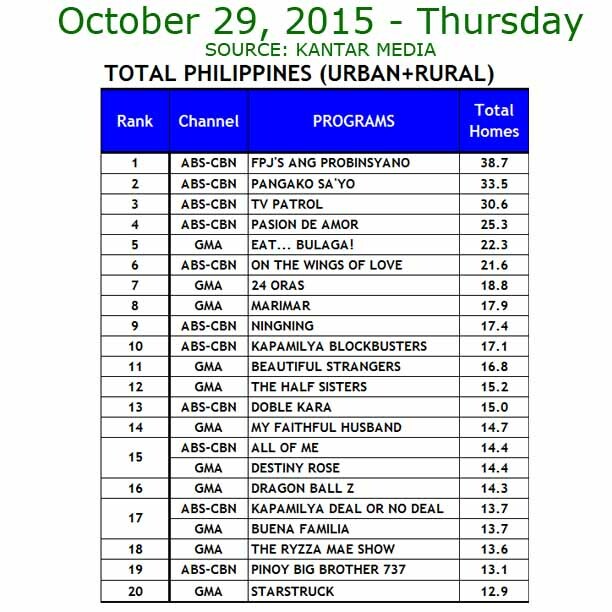 Average rating of Eat Bulaga on weekdays is on the range of 22-25% due to AlDub phenomenon. It's Showtime on the other hand, usually gets 12-14% of audience share. The biggest jump on TV ratings this 2015 was achieved during the 'Pastillas Girl' craze last September. As expected, noontime show Eat Bulaga halloween special was bannered by the popular loveteam of Alden Richards and Maine 'Yaya Dub' Mendoza collectively known as AlDub. In the Kalyeserye segment on Saturday dubbed as #ALDUBBahayNiLola, Alden and Maine went to the De Explorer sisters' house to help them (Lola Nidora, Lola Tinidora and Lola Tidora) find the jewelry box. The search became scary as they heard unusual voices voice inside. Later, lucky Alden found the box with a ring. He then knelt to Maine to offer the ring. Meanwhile, the episode on Saturday became controversial as costumes of Tito Sotto, Vic Sotto and Joey de Leon drew flak from netizens and ARMM governor. Kit Cunanan captivated the madlang people and the judges with her impressive talent and charm and bagged home a cash prize of P300,000. Landing on the second place was Mary Christine Nishie while securing the third spot was Julianne Tuason who both won a cash prize of P50,000. Meanwhile, “It’s Showtime’s” battle of spooky costumes and creepy dance routines “Halo-Halloween” also had its champion on Saturday. The group “Names Going Wild” won P100,000 with their horror-themed performance. 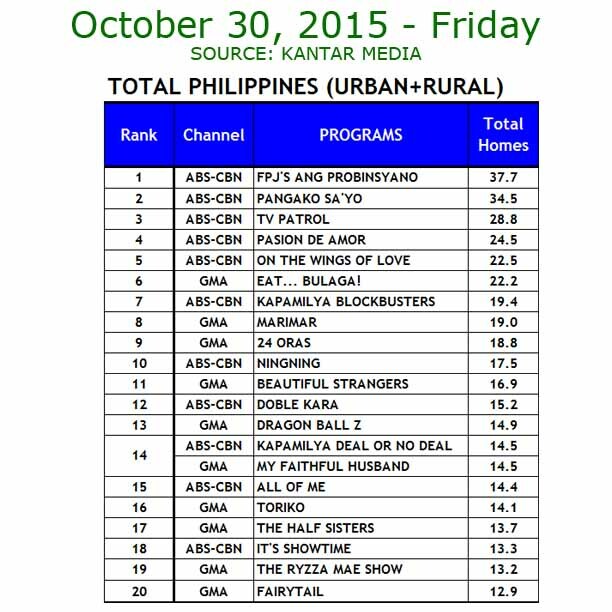 The revelation of Kardo’s true identify in “FPJ’s Ang Probinsyano” topped all programs nationwide last Friday with 37.7 percent. 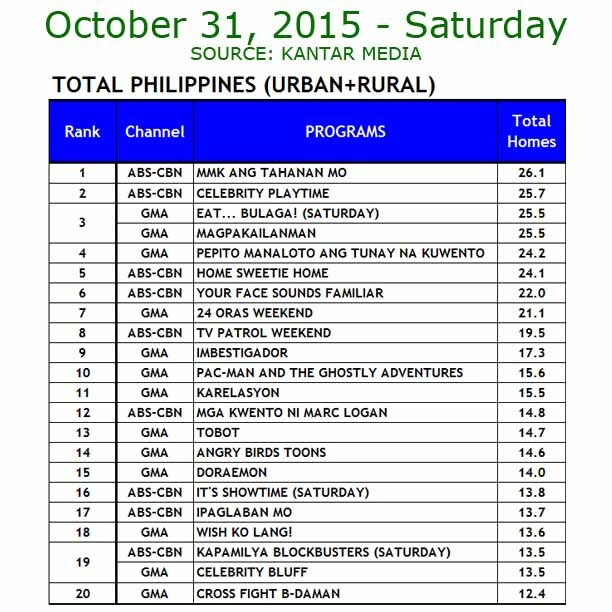 “MMK” was the most watched program last Saturday with 26.1 percent.